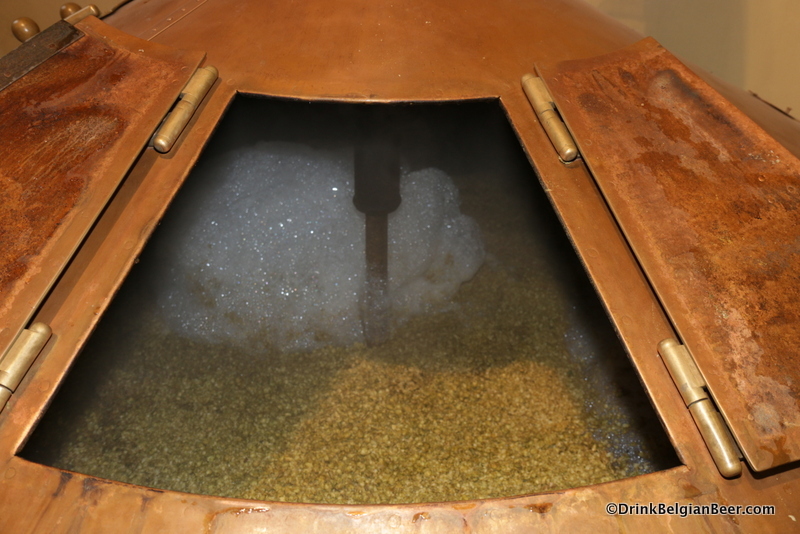 Hot wort that has been produced by the mashing of the grains is pumped out of the taps on the lower side of the mash tun, and up to the two boiling kettles, on the second floor, one floor above the mash tun. 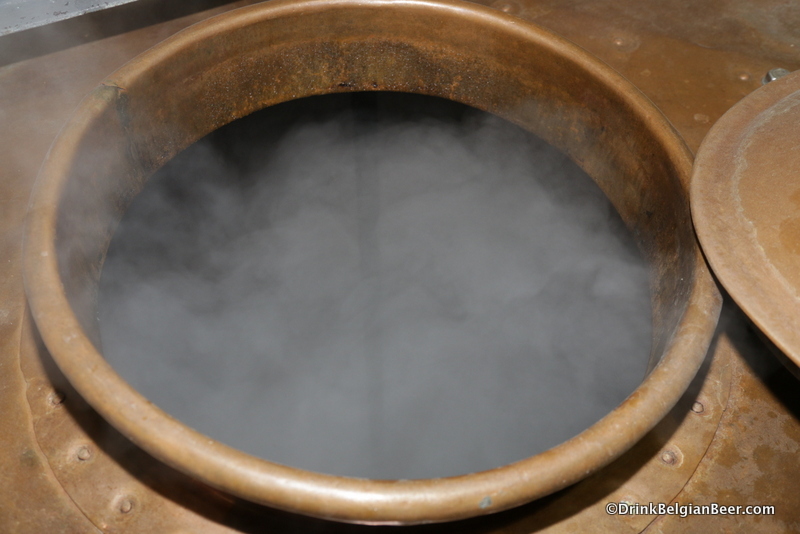 The left boiling kettle dates to 1937, and is called the “Grande cuve d’ébullition” (Or: “Big boiling kettle.”) The right side boiling kettle dates to the 19th century, and is called the “Petite cuve d’ébullition” (Or: “Small boiling kettle.”) Here, starting around 11.00 am on a typical day, the wort will be boiled for about four hours. 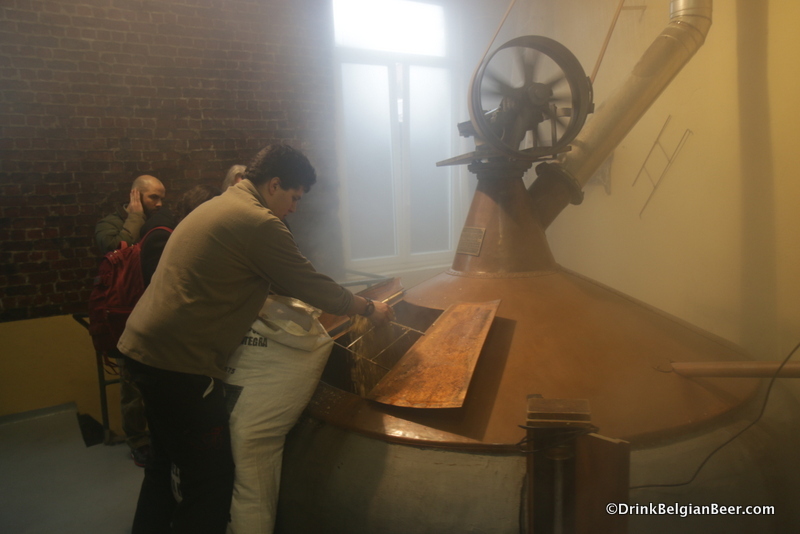 Aged hops will be added to both the copper kettles. These aged hops are at least three years old, so that any bitterness/hoppy character is gone. Aged hops are used only as a preservative in lambic beers, and act as protection against lactic acid bacteria, which can impart lambic with an overly acidic taste. 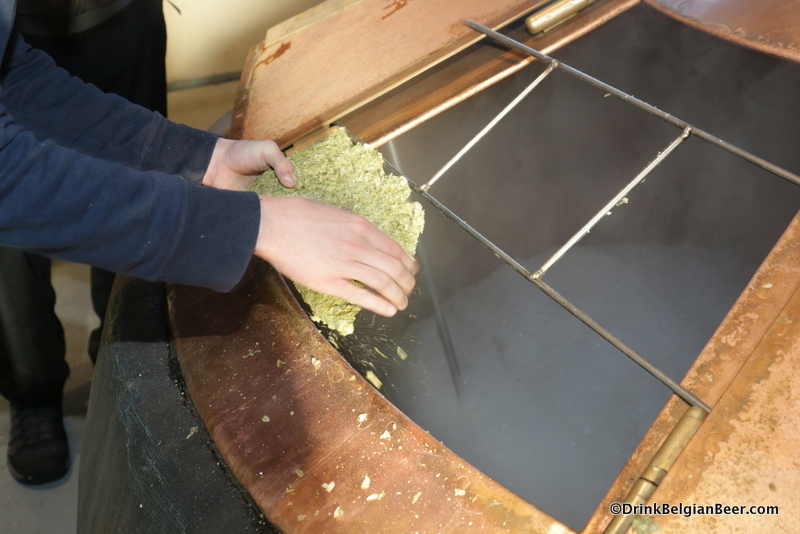 The aged hops used are whole hops flowers, and often have to be broken up by hand or with tools such as a screwdriver before being throw into the boiling kettle, as the hops can fuse together over time. 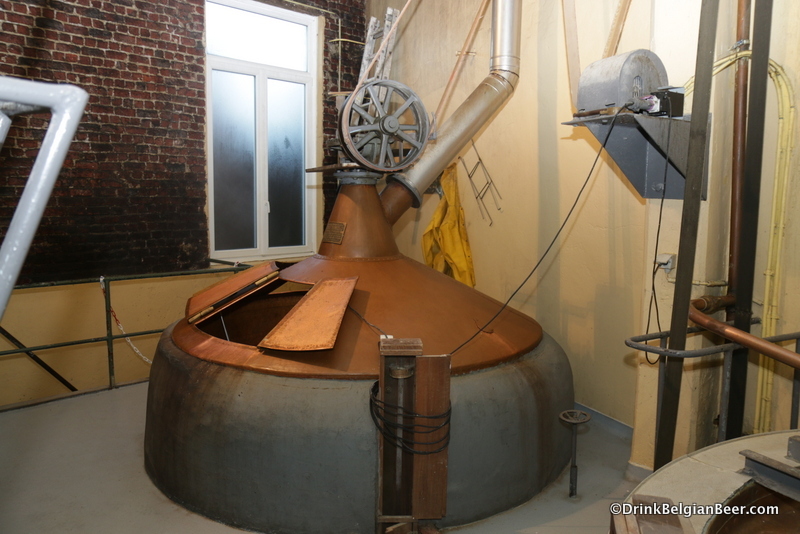 The brewhouse at Brasserie Cantillon, with two boiling kettles. 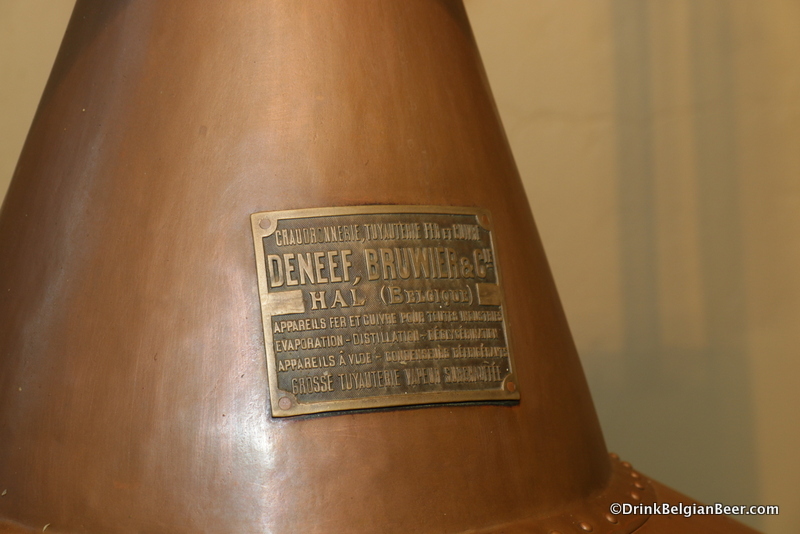 This copper kettle, the “Grande cuve d’ébullition” (or “Big boiling kettle”) was manufactured in Halle (Hal), ten miles south of Brussels, in 1937. 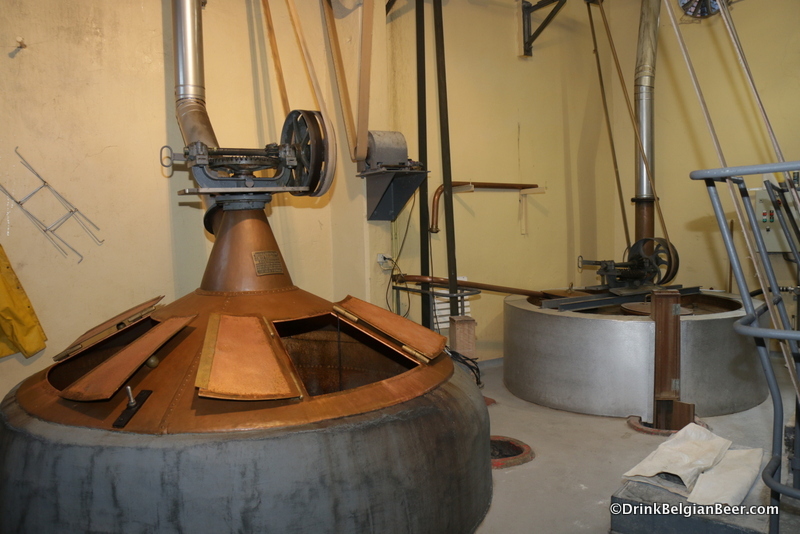 The inside of the Grande cuve d’ébullition (Or: “Big boiling kettle.”) It’s all copper. 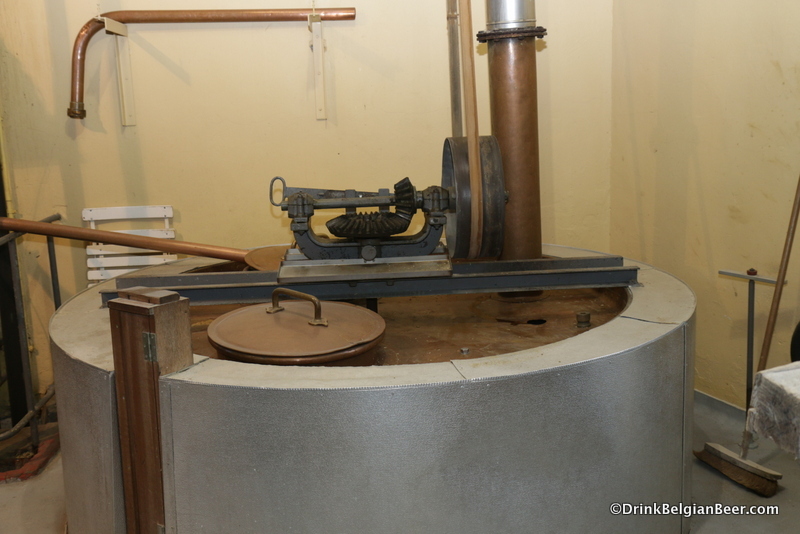 The “Petite cuve d’ébullition” (Or: “Small boiling kettle”) at Brasserie Cantillon. 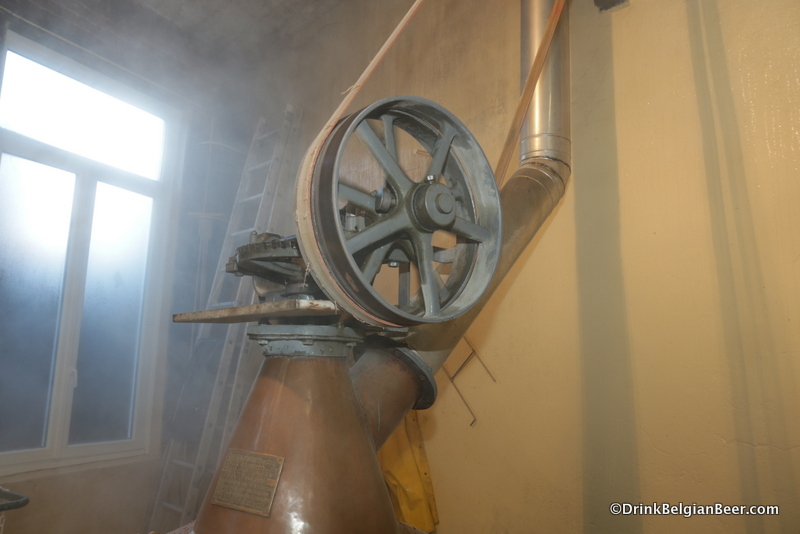 The top of the “Petite cuve d’ébullition” (Or: “Small boiling kettle”) at Brasserie Cantillon. 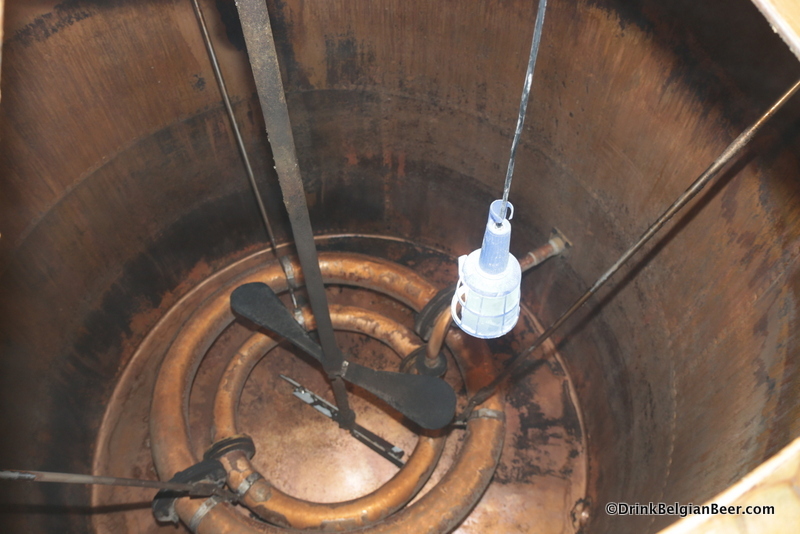 Another view of the two boiling kettles at Brasserie Cantillon. Wort being pumped into the Grande cuve d’ébullition at Cantillon. 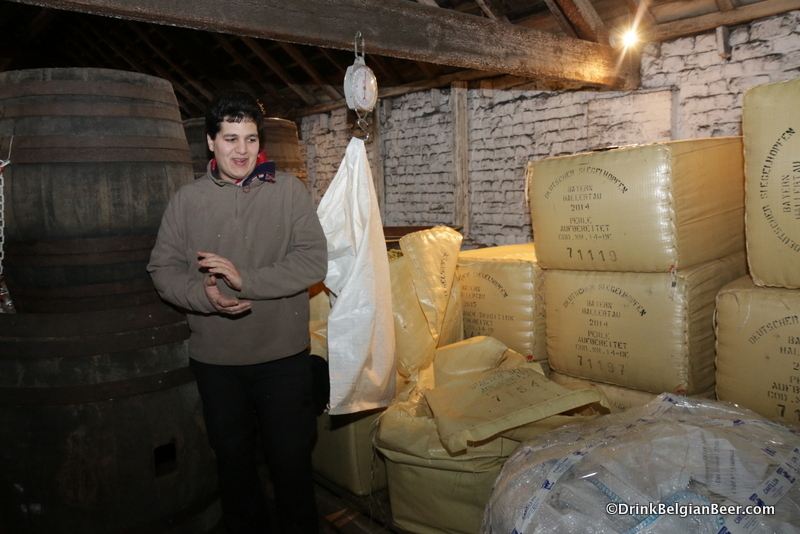 Jean Van Roy at the Grande cuve d’ébullition. 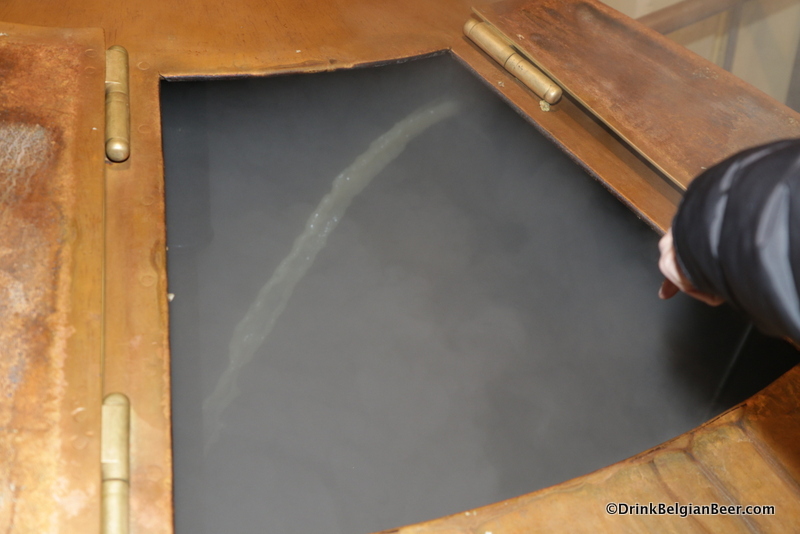 You can see a stream of wort being pumped into the kettle. 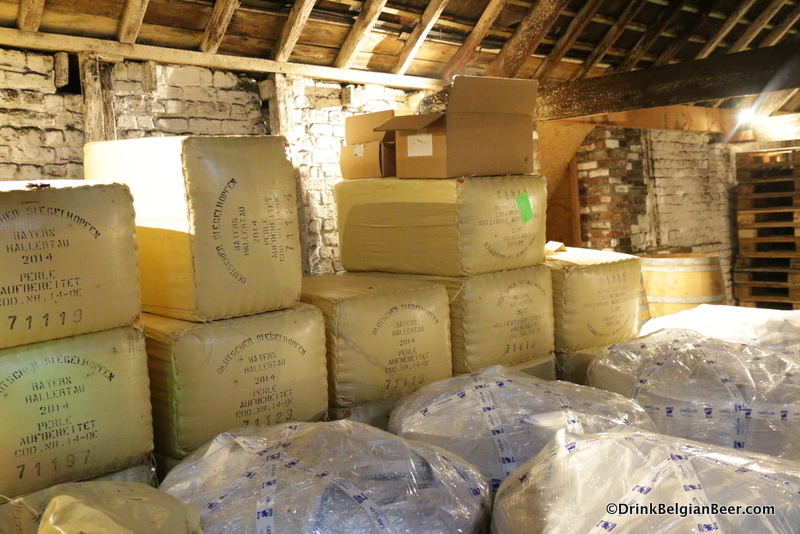 Bales of aged (2014) hops in the attic (top floor) of the brewery. Cantillon uses the high-tech scale shown in the center of this image with a bag hanging from it, to weigh hops to measure out the desired amount prior to adding them to the boiling kettle. 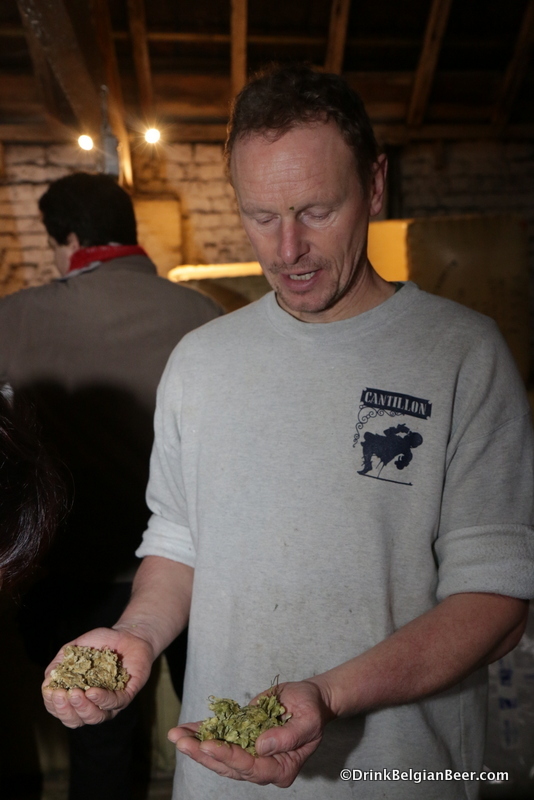 Cantillon brewmaster Jean Van Roy with aged whole hop flowers. 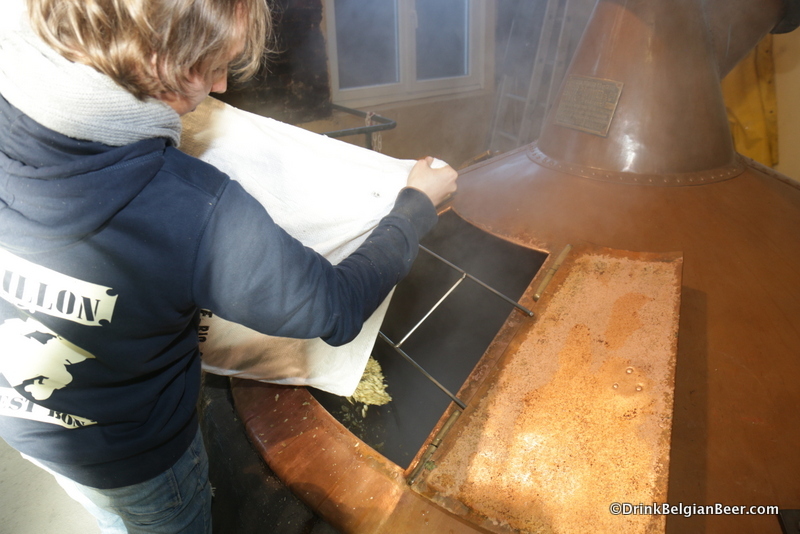 One of the Brasserie Cantillon team adding aged whole hop flowers to the Big boiling kettle. 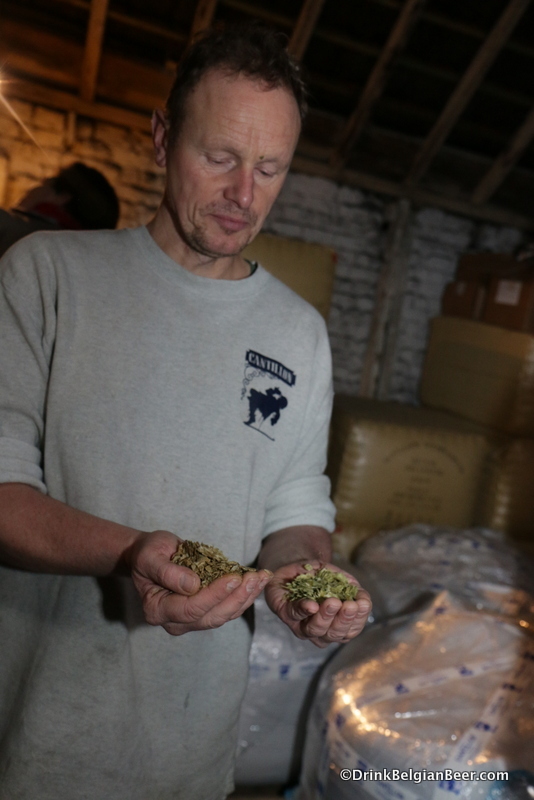 Aged hop flowers being added to the “Grande cuve d’ébullition” at Cantillon. 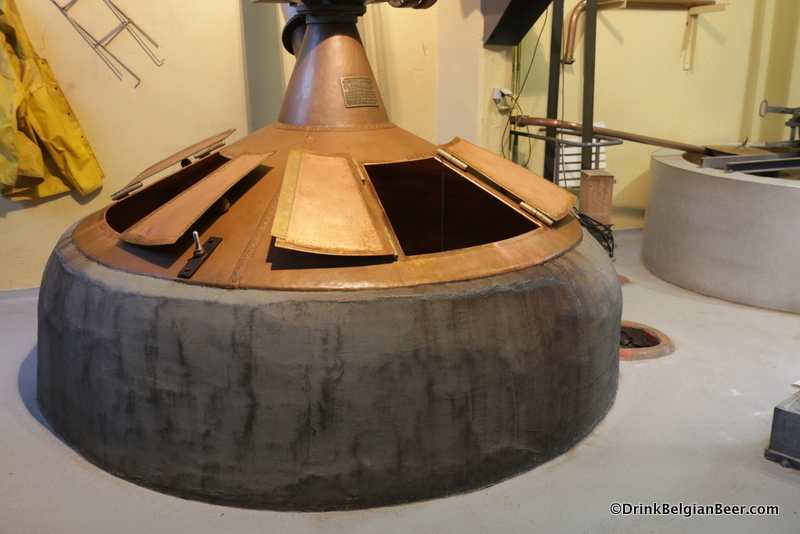 The “Grande cuve d’ébullition” full of aged hops. 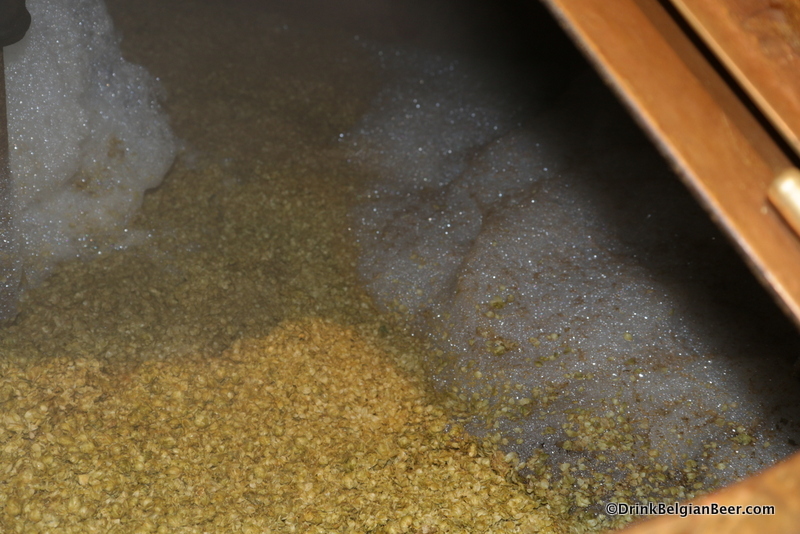 Close up of the aged whole hops inside the Grande cuve d’ébullition. 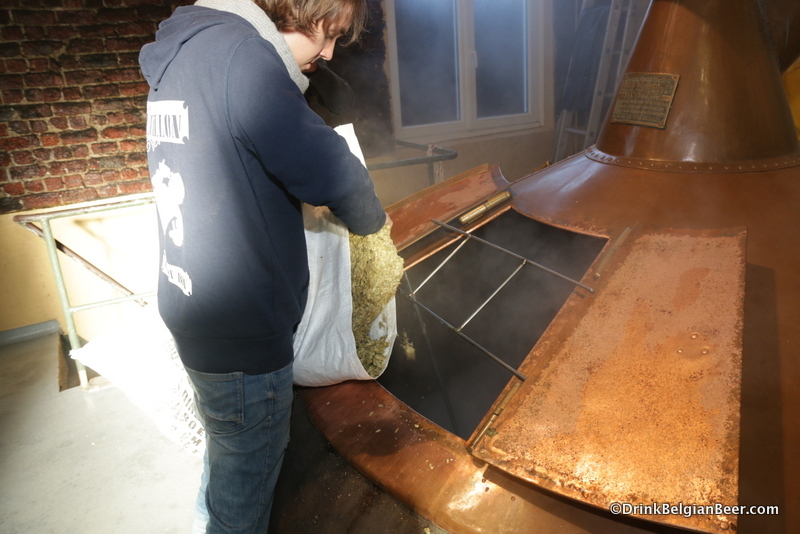 A member of the Cantillon team preparing to add aged hops to the Grande cuve d’ébullition. 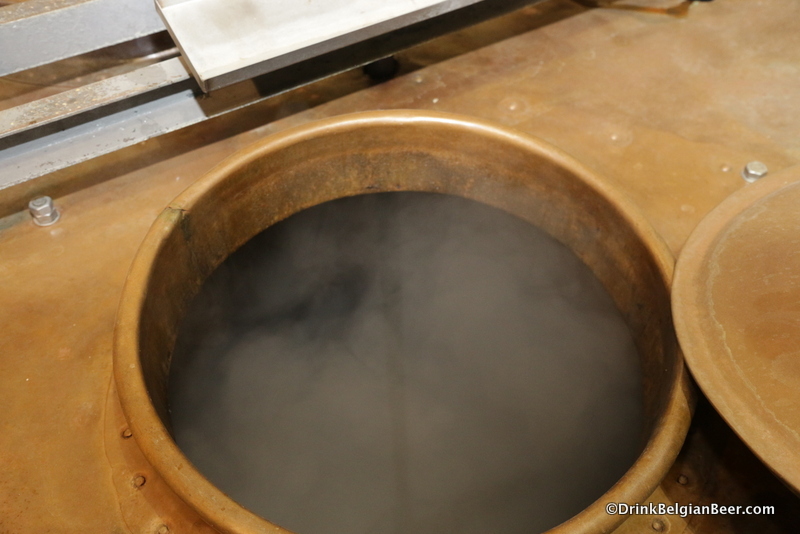 You can see a stream of wort pumping into the kettle from the right. 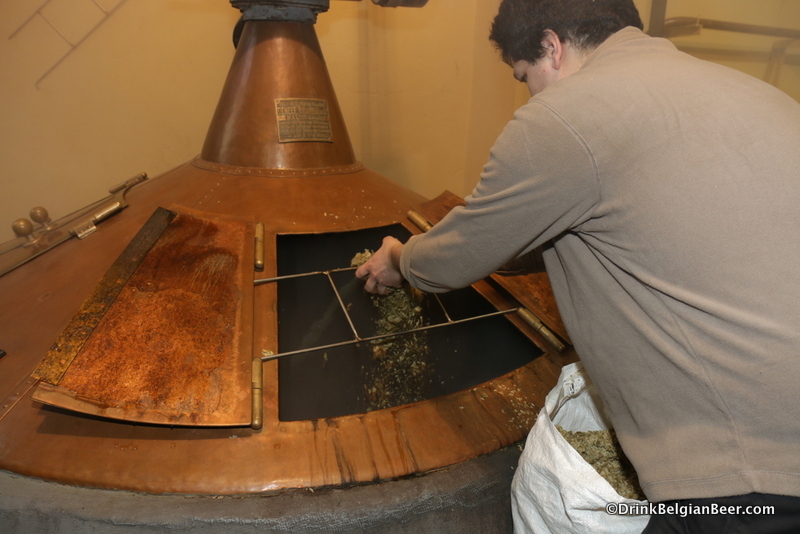 Aged hops being put in the Grande cuve d’ébullition. 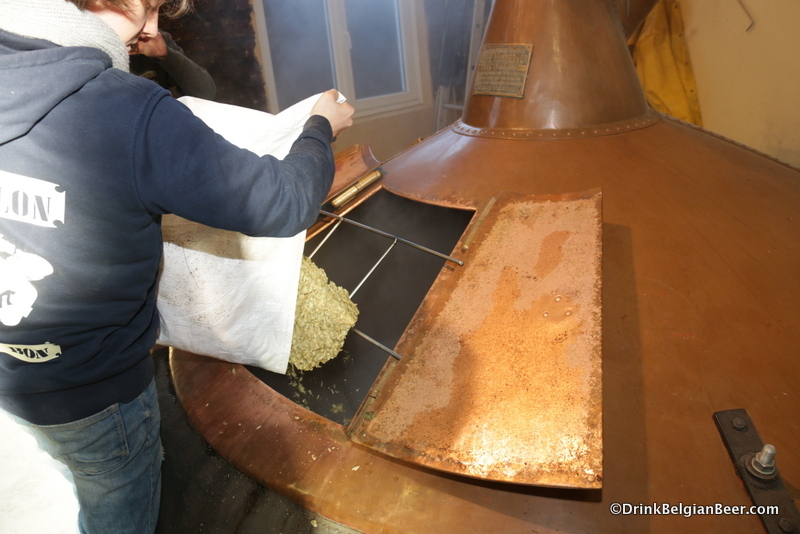 A large clump of aged whole hops being added to the Grande cuve d’ébullition. 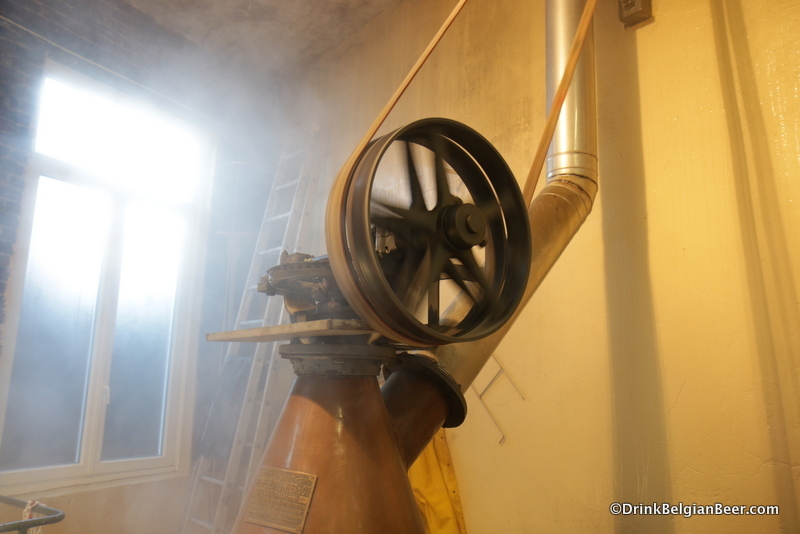 Adding aged hops to the Grande cuve d’ébullition. 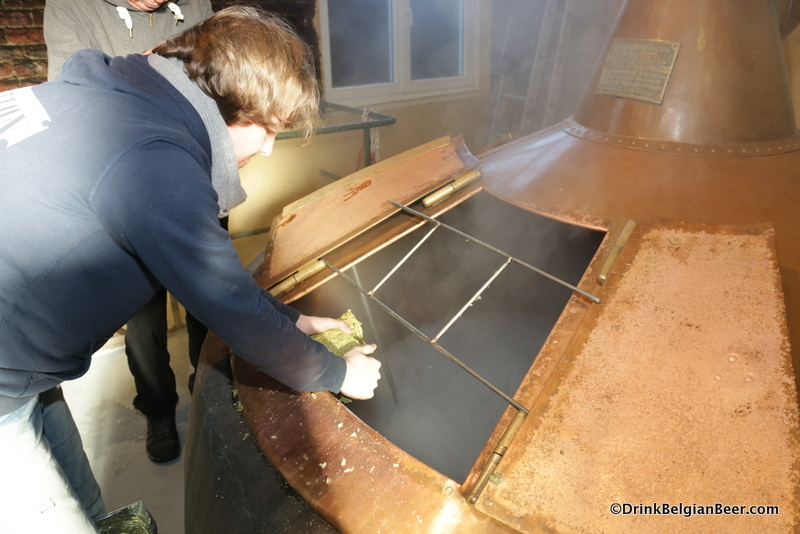 Close up of aged whole hops being added to the Grande cuve d’ébullition. 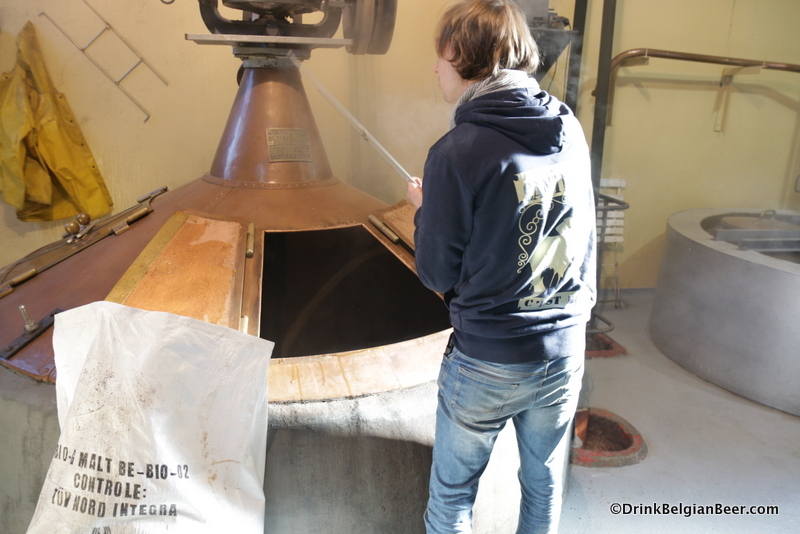 Another view of a Cantillon team member adding aged whole hops to Grande cuve d’ébullition. 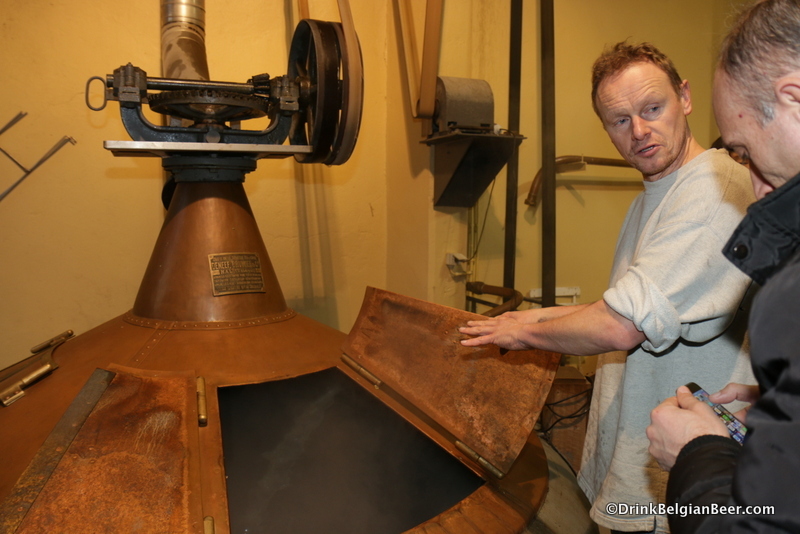 A look inside the Petite cuve d’ébullition” (Or: “Small boiling kettle”) at Cantillon. 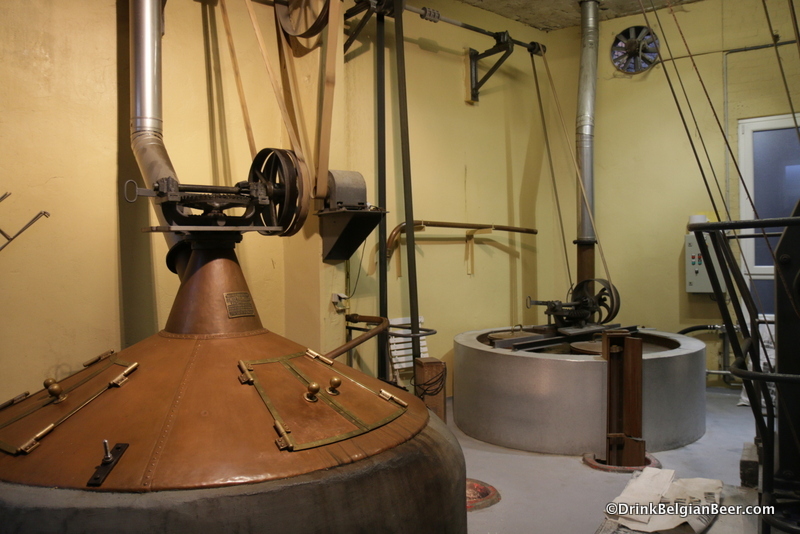 Another view inside the Petite cuve d’ébullition” (Or: “Small boiling kettle”) at Cantillon. View of the top of the Grande cuve d’ébullition, in action. 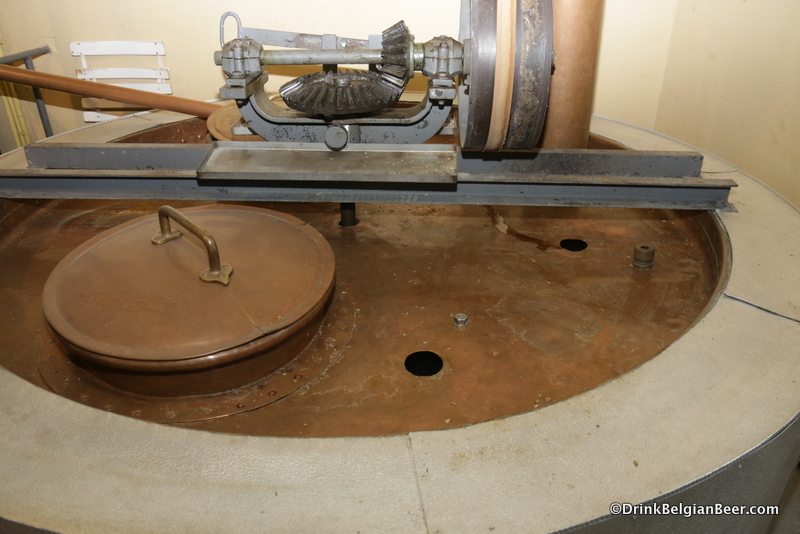 Another view of the belt and pulley on top of the Grande cuve d’ébullition, in action.